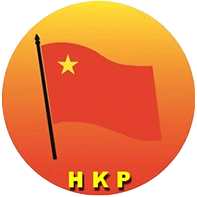 The People’s Salvation Party (HKP) is a communist party which was established in June 2005. The party follows Marxist-Leninist theorician Hikmet Kıvılcımlı, who is also considered to be the party's honorary leader. The party established itself as the successor of Kıvılcımlı's Maoist line and represents a national line in the Turkish far-left that also associates itself with pro-Kurdish movements.